Jim Marshall Farms Foundation, Inc. The Jim Marshall Farms Foundation, Inc. is a not-for-profit dedicated to helping those with depressive illness. We do this through various activities and events, such as our Lecture Series that runs from April through November each year. We believe that nature and especially animals are helpful to people facing a variety of challenges. 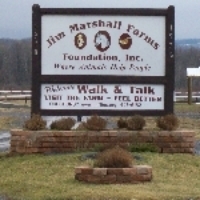 The Jim Marshall Farms Foundation, Inc is located at 1978 New Boston Road in Chittenango, New York. 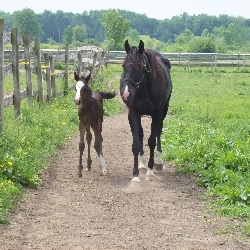 Our activities occur on a working horse farm, which has been adapted to be accessible to those with mobility impairments. "The most tragic occurence that can happen in our lives is to lose a child, relative, or friend to suicide. This leaves us with a lifetime of wondering what we could have done to save this precious life. The Jim Marshall Farms Foundation was established to provide people suffering from depression with a refuge from their troubles and a place where you are greeted with a friendly smile, a kind word, and the unconditional love that animals provide." There have been many donors, both private and public that we would like to extend our gratitude to. Without these donations the Foundation would not be as successful as it is. The Jim Marshall Farms Foundation, Inc. does not receive government funding and does not have any loans or outstanding debts. Where animals help people !